This chapter will look at ways of building into the research itself notions of rights and the power to sustain the work outside the context of the northern researchers who are likely to be the grant holders. 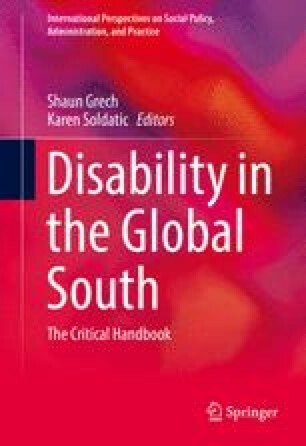 We note the obstacles and barriers currently preventing the full enjoyment of rights by people with disabilities in the global South, by exploring how increasing participation and decision-making power in monitoring rights can lead to more sustained social change. Barnes, C. (2001). ‘Emancipatory’ disability research: Project or process? Public lecture, City Chambers, Glasgow, 24 October. Retrieved February 11, 2015, from http://disability-studies.leeds.ac.uk/files/library/Barnes-glasgow-lecture.pdf. Barnes, C. (2009). Disability in the majority world context: A materialist account. Presented at Disability and Economy Conference, Manchester Metropolitan University, Manchester, 29–30 April. Retrieved February 11, 2015, from http://disability-studies.leeds.ac.uk/files/library/Barnes-majority-world-2.pdf. Oliver, M (2002). Emancipatory research: A vehicle for social transformation or policy development? Presented at 1st Annual Disability Research Seminar, Dublin, 3 December. Retrieved February 11, 2015, from http://disability-studies.leeds.ac.uk/files/library/Oliver-Mikes-paper.pdf. Rioux, M. (Ed.) (2000). Let the world know: Report on a seminar on human rights and disability. Office of the Special Rapporteur on Disability of the United Nations Commission for Social Development. Retrieved February 11, 2015, from http://www.un.org/esa/socdev/enable/stockholmnov2000.htm. UN Office of the High Commissioner for Human Rights. Concluding observations reports by the committee on the rights of persons with disabilities. Retrieved from http://tbinternet.ohchr.org/_layouts/treatybodyexternal/TBSearch.aspx?Lang=en&TreatyID=4&DocTypeID=.